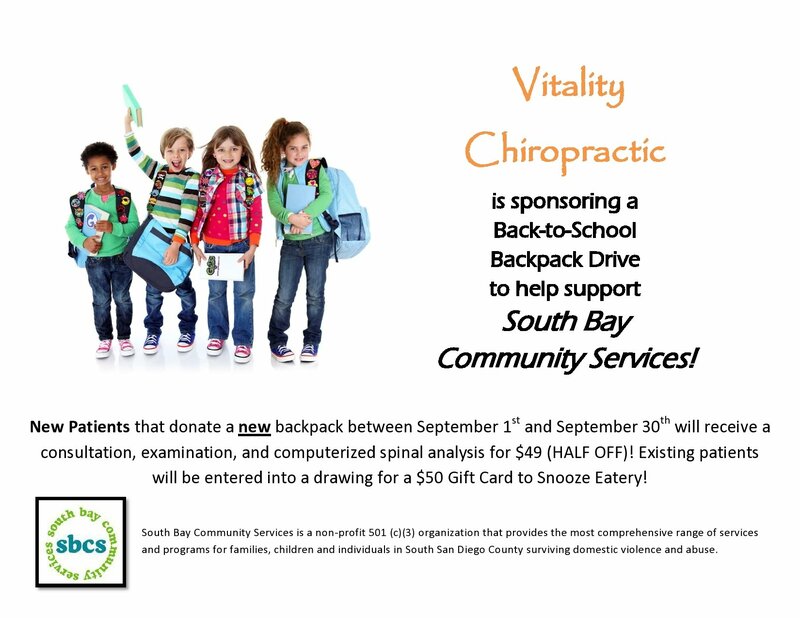 We get so excited every year to team up with South Bay Community Services (SBCS) for our annual backpack drive! Each new backpack we collect goes to a displaced foster youth, who would otherwise potentially start a new school year without the foundation of school supply success! Join us September 1st to September 30th and help us collect even more backpacks than last year! Every New Patient that donates will receive a $49 exam (that’s 50% off!) and all existing patients will be entered into a drawing for a $50 gift card to Snooze Eatery here in Hillcrest! Tell a friend, tell your family, and tell that coworker who keeps saying they need to see the chiropractor! Let’s send some kids back to school ready for success, and with smiles on their face! Stay tuned to the blog and our Facebook page for updates, videos, and for when we announce the winner of the drawing on October 1st!